Although muffin wrappers are useful when it comes to cleaning your muffin tin, that's not their primary function. No, their major role, at least for me, is to act as an obstacle between me and said muffins. If the wrapper wasn't there, I'd tear into those suckers willy-nilly until my stomach seams popped. Especially when said muffins are miniature AND taste like pecan pie. You've no doubt seen these pecan pie muffins before, and I didn't make any special changes. Just know that they're addictive and delightful, and if you haven't yet experienced the wonder that is the pecan pie muffin, you really should. And heed my words, folks--use the muffin cups. The pecans that I used for these were outstanding. They came from the Pecan Store, which boasts the "freshest, yummiest pecans on earth." I believe it. In addition to pecans (which you can get covered in anything from butterscotch--swoon--to dark chocolate to cajun spices), they offer cookie and bread mixes, honey butters, salsas, and all kinds of jams, jellies, and sauces. The Pecan Store (a division of The Green Valley Pecan Company located in Arizona) is worth a look, because based on the pecans I received, its products are of the highest quality. Meanwhile, as a pie lover and math nerd, I'm ashamed to admit that I didn't realize today was Pi Day until this morning. It's fair to think of these as pie in muffin form, wouldn't you say? I would. Happy Pi Day! Combine the pecans, brown sugar, and flour in a large bowl. In a medium bowl, beat the eggs until foamy and stir in the cooled butter and vanilla. Add this to the dry ingredients, stirring until moistened. Pour into a lined muffin tin, or a sprayed silicone pan (if you like to live dangerously or are able to exhibit stellar self-control). Bake for 20-25 minutes or until a tester comes out clean. Remove the muffins from the pan immediately and cool on wire racks. Oh dear.... those look soooo good! I love anything with pecans. Oh man, these must be super dangerous to have a 'cupcake liner' warning attached to them. They look totally amazing, and I'm head over heels for pecans! I can't wait to try these. Your muffins look so yummy! mmmm. those sound delicious! i too appreciate the self-control that a cupcake liner allows me to have. i'll check out that pecan place! How I long for a litte muffin right now. Just a small morsel to stuff in my pie hole. Yum. I had oatmeal and fruit this morning....BORING, but tomorrow I will be making something so not good for you and totally delicious! Yeah for Sundays. Your muffins look scrumptious. There's nothing better than pecan pie in muffin form. I think the wrappers are also good for separating the muffin top from the rest. For some reason, I just like the muffin tops. My mother, also a southerner, swears by Joe William's Pecans. http://www.joecwilliams.com/ Have you heard of them? Better than a pecan pie...these muffins look absolutely great! There is nothing like a really good pecan. It makes all the difference between "good but ordinary" and "fabulous." I would love to have one of these pie muffins right now! They look wonderful and, yes, I think they'll pass the test for Pi Day. Happy Pi day! I didnt know how I missed that one!!!! Have any more muffins left for me?? These look great! I'm going to have to check out those pecans, they sound so good. I'm excited for a source of really good pecans! Thanks for the info! Happy Pi Day! You know me, Miss no self control so looks like i'll need muffin liners! I must tell my husband about Pi Day! He LOVES math. I wont tell them about these wonderful cupcakes because then I would have to make them. And of course I would then eat them like popcorn! The recipe looks ultra simple and the muffins look delicious. I, for one, would opt for the muffin liners since I've never claimed to have self-control and I better not start now. What an easy recipe...I love it. I hate those pesky little wrappers they hinder me from enjoying every ounce of the muffin. I would love 3.14 servings of these muffins! I mean they are Pecan Pie Muffins! I've not heard of that pecan supplier before, and, in my opinion, any place that sells butterscotch pecans is a mighty fine place, indeed. YUM! Oh no, this now makes it possible to have pecan pie pretty much every day. Fantastic! Happy 3.14159265358979323846. Happy Pi day:) Those muffins look fabulous! Yum - pecan pie muffins! What a great idea, they look fantastic. Whereas I see muffin cups as the hard evidence of how many I have consumed. No matter how deeply I bury them in the bin, they always seem to get spotted. So I avoid using them altogether. I have to admit, I am not a fan of pecans. But you've kind of convinced me I may be missing out on something. They look yummy. Pi day indeed. Maybe that's why I made mini quiches. Do quiches count? Ack I left a comment but it did not go through. Pecan pie is the best! Just don't eat the wrapper! Great lookin muffin Grace. Oh boy. I bet I could eat the whole pan of these! I think they count for Pi day...and they are so cute! 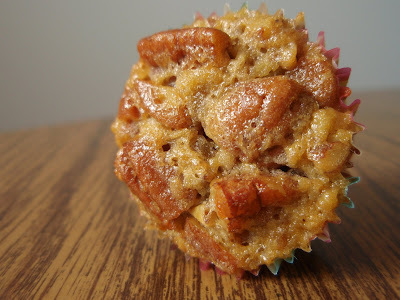 I have not had pecan pie muffins before, but suddenly I'm craving them! They look so yummy! Love pecans in anything! I remember having the best pecans ever when I lived in Az! I am glad to see you putting these to good use, the muffins have got to be fabulous!! There is no self control when pecan pie muffins are in the house. Even frozen, they're delicious so forget about escaping temptation just because they're in the freezer. I have this love/hate relationship going with muffin cups - there's just no "grace"-ful way of eating them. Grace, these look AMAZING! I definitely will be taking a look at the Pecan store, too. Oooooo, those look goooood. Grace the muffin wrapper does not stop me, slows me down but doesn't stop me. :-) I need to find something that does. Grace, I'd be tempted to try and eat the paper...why not, what's the worse thing to happen? This post has me missing Texas :), I am a fan of muffin cups, but agree that they get in the way ;). Pecan pie muffins are the way to go! I just picked up a bunch of pecans - I guess I know what I'll be making. Pecan pie muffins?! What a fantastic, delicious idea. Happy pi day to ya. Hello there, I am wondering how one joins The Cake Slice? Grace- These look to die for!! I so have to get to these. Id like one right NOW with my coffee. Oh please, just one?? Great muffin recipe!! I need to get me some pecans! Ah, ha! Is that why? I am so getting down with the amount of flour in the recipe. I don't have pecans, but I do have walnuts. I'm going to give this puppy a whirl this week. They look delicious! Just saying hi! Thanks for your comment! Anything with pecans is pretty much a winning recipe. These sound delicious! My favorite muffins are always the mini muffins, because I can eat more than one without feeling too guilty! On a side note, I confess to eating peanut butter toast for breakfast (more often than not) ... imagine my delight with the Barney Butter you sent my way ... this would make absolutely fantastic cookies! Big Hugs Grace ... and a big big thank you for introducing me to this (new to me) product. Hi Grace..thank you for your sweet comment on my blog. I have been so touched by the kindness of the people in 'blogland'. oh I'm so with you! I love pecans: any way, any spiced-way. Why can't pecans be like almonds and be good for you and not so darn fattening? 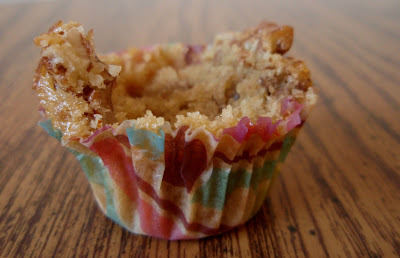 I think I made batch of pecan pie muffins, but I added heat to them--so good, just like these. Love the crispy top on these. Pecan Pie in muffin form, I would eat a whole pies worth! Wow, what a short ingredient list....1,2,3 and it's in my tummy. I've said it before, and I'll say it again, you got butter, brown sugar, and pecans. What's not to love? These look fantastic!! Wow, they're so simple, too! could really use one right now. I'm always up for pecan pie--even in a muffin! 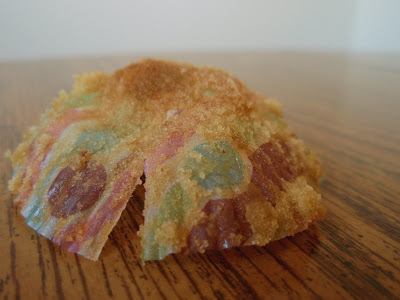 i love cute muffin wrappers; they just add so much fun to the cake! i actually just got some supercute ones today! I was wondering why some muffins stuck to the liners....Is it a sign that it needs to cook longer? In any case...looks like - Grace 1, Cupcake Liner 0. I have not seen these before, but I am so making these tonight. Pecan pie in muffin form...I am all over it! Grace, I made these the day you posted this and they were a HUGE hit! And so much easier than actual pumpkin pie! Being the greedy types, we made them in a regular size muffin pan. It made 7, which is perfect for the 3 of us to nosh on for a few days. Fantastic! Thanks for sharing! I have totally fallen in love with muffins and cupcakes lately. As a yankee, I have to confess to you that I spent most of my life NOT liking pecan pie. However, upon dating a southern boy whose grandma happened to make the most amazing pecan pie I have ever tasted in my life, my entire perspective on pecan pie has changed. And, these muffins sound like the best idea I've heard all week. Nice, Grace! To me the whole point of the wrapper used to be chewing it to get all the good stuff out when the muffin was gone. I know. Gross. I've reformed my sad ways. But oh that wrapper is tempting. Looking so yummy like this, disappear instantly! LOL - you make me laugh. Mini pecan pie muffins - who knew such deliciousness existed? !